Get ready to shake things up for your next Taco Tuesday! 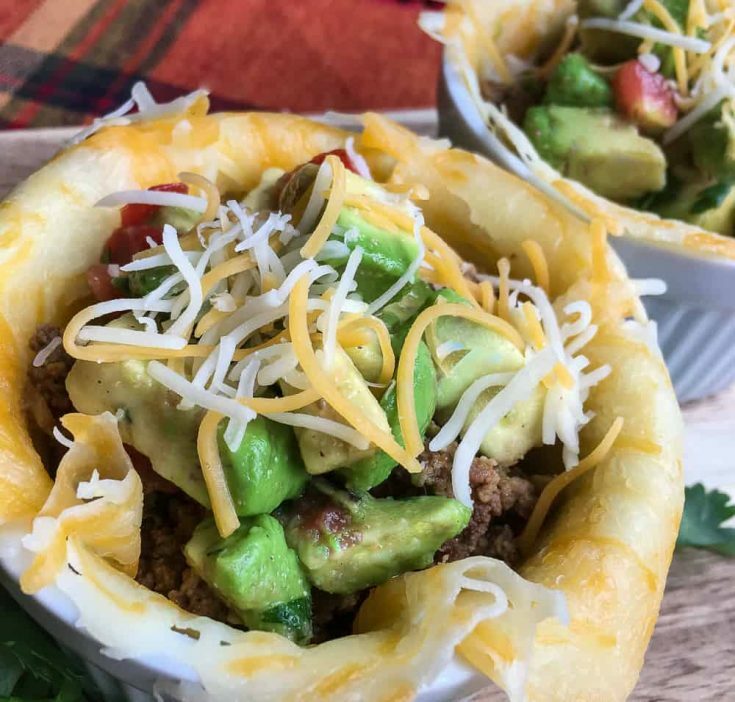 These Low Carb Taco Cups with Avocado Salsa put a spin on the traditional taco by eliminating the shell and replacing it with baked shredded cheese. This recipe is perfect for not just those following a low carb, gluten free or grain free eating plan, but anyone looking to put a fun and tasty twist on their tacos. 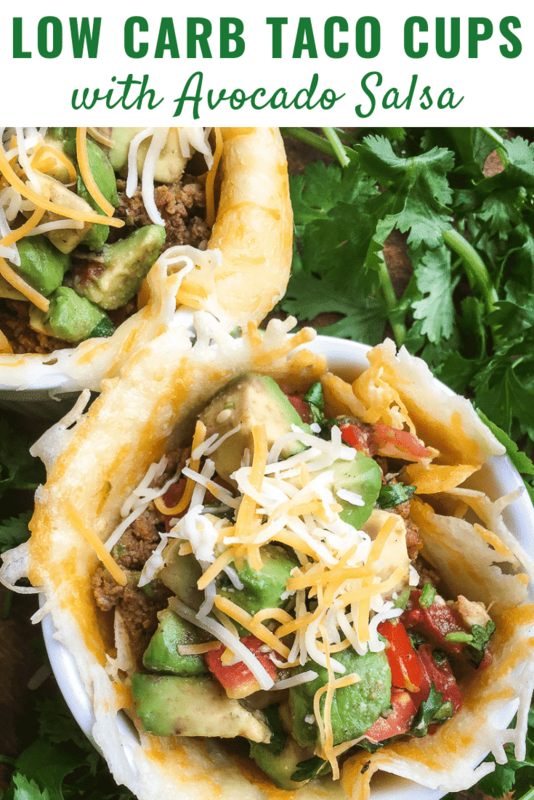 While these taco cups are low in carbs, they are high in flavor. The baked cheese shell is filled with deliciously flavorful ground beef seasoned with cumin, smoked paprika, onion powder, chili powder and garlic powder. And a zesty homemade avocado salsa tops it all off. 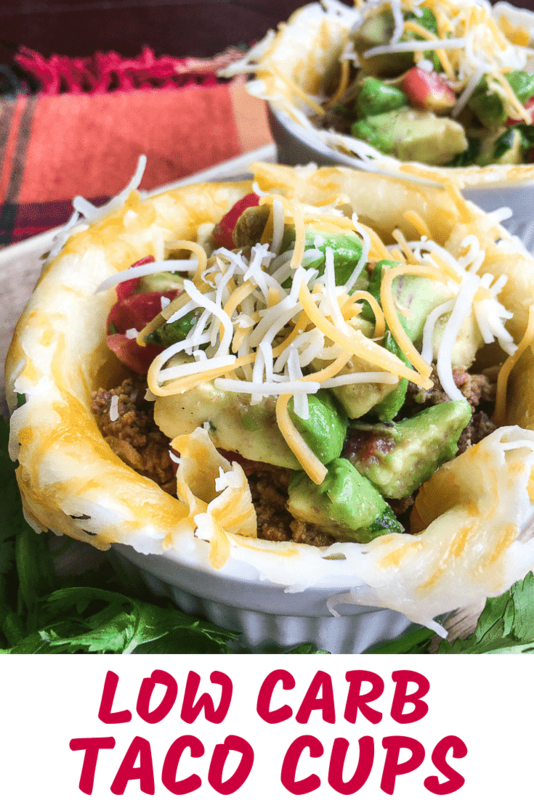 Trust me when I say that these Low Carb Taco Cups with Avocado Salsa will be your new favorite dish! 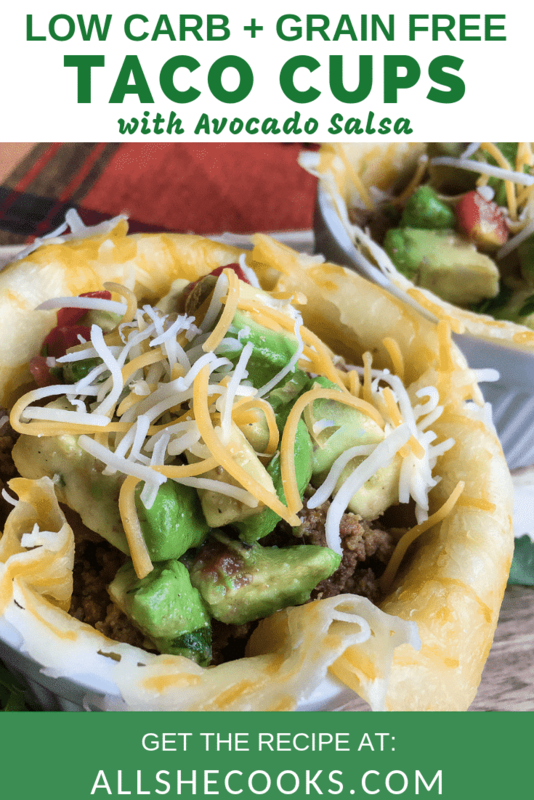 Since the shells of these taco cups are made from shredded Colby Jack cheese and not tortillas, they are completely low carb, grain free and gluten free. Which makes them a great choice for those with dietary restrictions and allergies. These taco cups are satisfying, delicious, and healthy! Each serving has only 420 calories. Plus a serving is packed with 23.4 grams of protein, 3.9 grams of fiber, and only 8.2 grams of carbs. Because his recipe is SO quick and easy to make, you can be sitting down to enjoy these mouth-watering taco cups in just 30 minutes. Step #1: Preheat oven to 200°F and then line a large baking sheet with a piece of parchment paper or a Silpat® baking mat. Set aside. Step #2: Divide 1½ cups of the shredded cheese into 6 piles (approximately 1/4 cup each) on the prepared baking sheet and spread each pile into a thin circular layer. Step #3: Place baking sheets in the pre-heated oven until the cheese is melted and slightly browned around the edges, around 5-6 minutes. Step #4: Remove from the oven and let cool for 2-3 minutes, and then remove the cheese and press into 3” ramekins or a muffin tin to form cups. Let cool for several minutes before gently removing the cheese cups from the form. Note: If you are using ramekins, the taco cups can remain inside for extra support when serving. Step #5: In the meantime, add the ground beef to a large skillet over medium heat and cook until the beef is browned and cooked through, approximately 6-8 minutes. Then carefully drain excess grease from skillet and return to cooktop. Step #6: Next, add water and season with chili powder, ground cumin, garlic powder, onion powder, and smoked paprika. Season with salt and black pepper, to taste, and stir to combine. Simmer for 2-3 minutes or until warmed through. Step #7: While the beef is cooking, combine the avocado, tomato, lime juice, and fresh cilantro in a medium bowl. Season with salt and black pepper, to taste, and then gently stir to combine. Step #8: To serve, fill the taco cheese cups with beef, then add the avocado salsa and remaining shredded cheese. Finally, top them off with a dollop of sour cream, if using, and enjoy! Looking for more great tasting meals that are low carb and gluten free? Then check out these tasty Low-Carb Portobello and Sausage Breakfast Muffins this recipe for delectable Gluten Free Pasta Primavera Recipe with Sweet Potato and Zucchini “Noodles”, and this flavorful Low Carb Cauliflower Fried Rice. These Low Carb Taco Cups with Avocado Salsa put a tasty and healthy twist on traditional tacos. Divide 1½ cups of the shredded cheese into 6 piles (approximately 1/4 cup each) on the prepared baking sheet and spread each pile into a thin circular layer. Place baking sheets in the pre-heated oven until the cheese is melted and slightly browned around the edges, around 5-6 minutes. Remove from the oven and let cool for 2-3 minutes, then remove the cheese and press into 3” ramekins or a muffin tin to form cups. Let cool for several minutes before gently removing the cheese cups from the form. Note: If using ramekins, the taco cups can remain in the container for extra support when serving.